VCS (Variable Cushioning System) for ultimate support, plus a strong, heavy frame that offers extra stability. Powerful 2.5 CHP Digital Drive Motor for smooth and efficient performance, with 0.5 to 12 mph speed, and 0 to 12% incline range for varied workout options. 10 motivational programmes plus LED and dot matrix displays for convenient workout feedback. 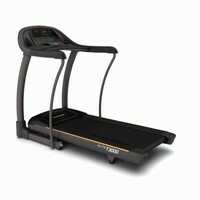 Running Area: 140 x 51 cm / 57" x 20"
Click the button below to add the Horizon - Elite 3000 Folding Treadmill to your wish list.